Adapted from “Tips for family reading”, Houston Parent, October 1995. There is nothing like reading together to build the bond between parent and child. Such reading can greatly improve the child’s achievements in school and in life. In fact, it will shape the child’s language and emotional develop-ment, self- esteem, social skills and creative expression. Also, reading to your child is fulfilling and fun. Parents who have books at home and who read to their children have children who are better readers and high achievers academically. Creating a love for reading is the cornerstone of your child’s education that will last a lifetime. Most importantly, teach your child that reading is the window to every opportunity in life. The exploration of shared spoken language, the reading of the world through dialogue, is a vehicle for bringing change into the world. Children who are read to learn to read more easily than those who are not. Reading to children helps build their curiosity, imagination, attention span, vocabulary and language skills. It also helps improve their spelling and writing abilities, promotes listening comprehension and helps them to think and communicate better. Children’s ability to comprehend what they read very much depends on the knowledge they already have, so the more they are read to the more knowledge they will have in store for use in future reading. Reading is a good conversational tool, providing parents and children with the opportunity to share thoughts and feelings. The child grows emotionally and important family bonds are built. Reading to your children lets them know that you value reading as an important activity in your life. 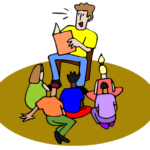 Establish a routine for reading aloud – a daily activity which will become a habit. Be proactive: move your finger under the words as you read; let your child turn pages with you; take turns reading paragraphs or pages; interject comments, such as “what do you think will happen next?”; look at and talk about the illustrations. Let your children see you reading your own books – i.e., be a role model. Talk to them about the things you read. Develop a family library – keep lots of books, magazines and newspapers and take them when you travel; give children books as gifts. There is no limit to the kinds of material to read – children’s books, biographies, science, adventure, even mail order catalogues. And make regular library trips so that your child becomes familiar with it and what it has to offer.